My son is not a happy camper right now. His birthday happens to land on His First Day Of School, as in, he's-going-to-kindergarten-at-the-big-school-first-day-of-school. It's a big deal for him and kind of over whelming at the same time. Two big mile stones in his life wrapped up in one day...so, yeah, he's not happy. 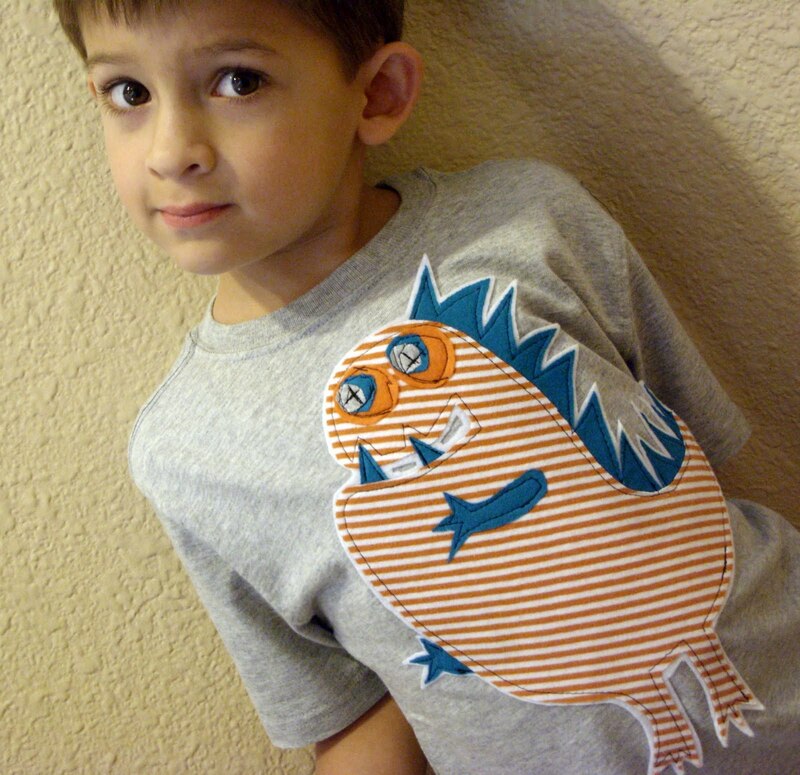 So in order to make His day super special, I made him a shirt to wear for His birthday on His first day of school. My inspiration was this shirt from Boden. First thing I did was pick-off the pocket from the $1 shirt I bought on clearance. I used freezer paper to make a pattern. 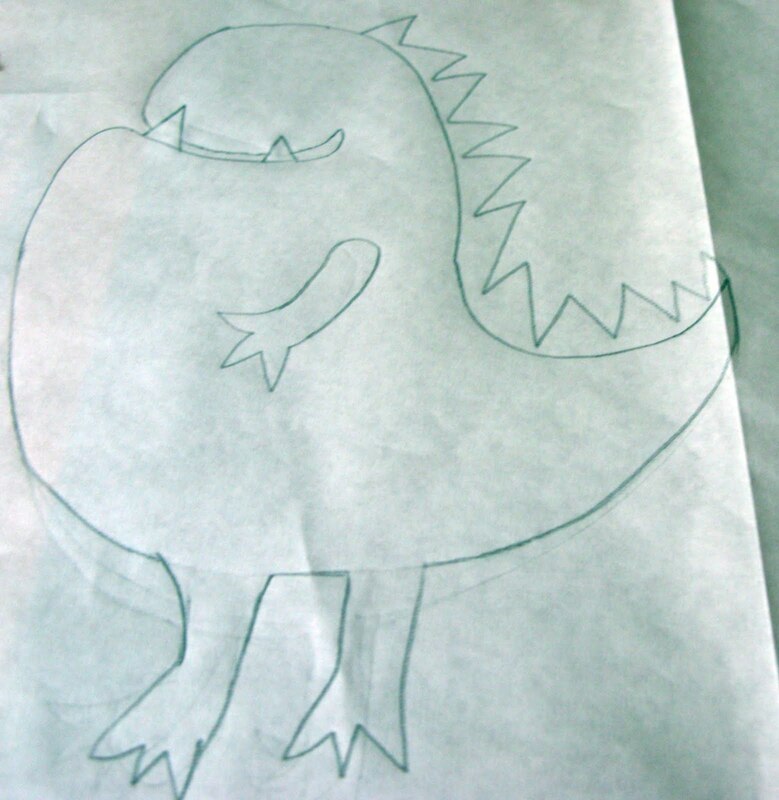 Looking at the picture in the catalog, I drew my version of the dragon on freezer paper (not on the shiny side). Can you see all the semi erased lines? I had a hard time drawing the feet but I finally drew feet that I was happy with. 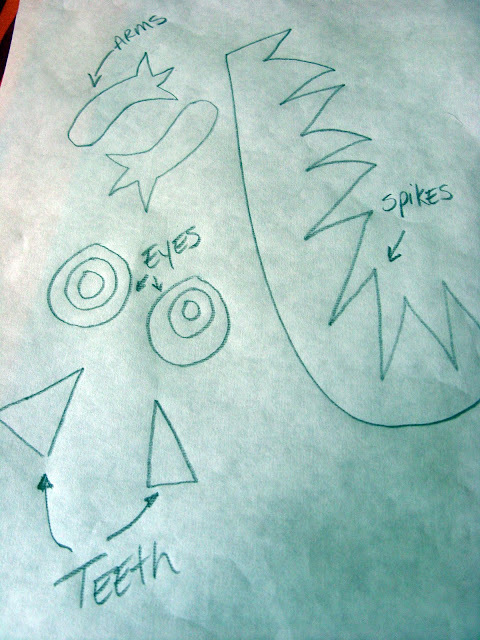 Using the hand drawn dragon as a template, I placed another piece of freezer paper on top and copied the spikes, eyes, hands and teeth. and ironed it (shiny side down) onto the t-shirt fabrics that I used. These came from t-shirts that don't fit my kids anymore. 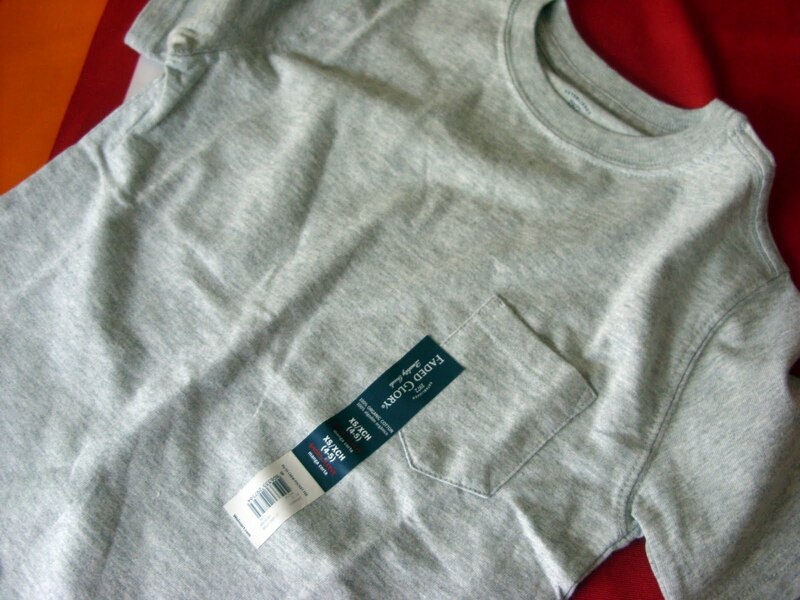 See the grey fabric? It's the picked-off pocket and it became part of the eyes. Then I ironed fusible web to the back of the t-shirt fabric. So, basically, the top has the freezer paper ironed on and the back has fusible web ironed on. 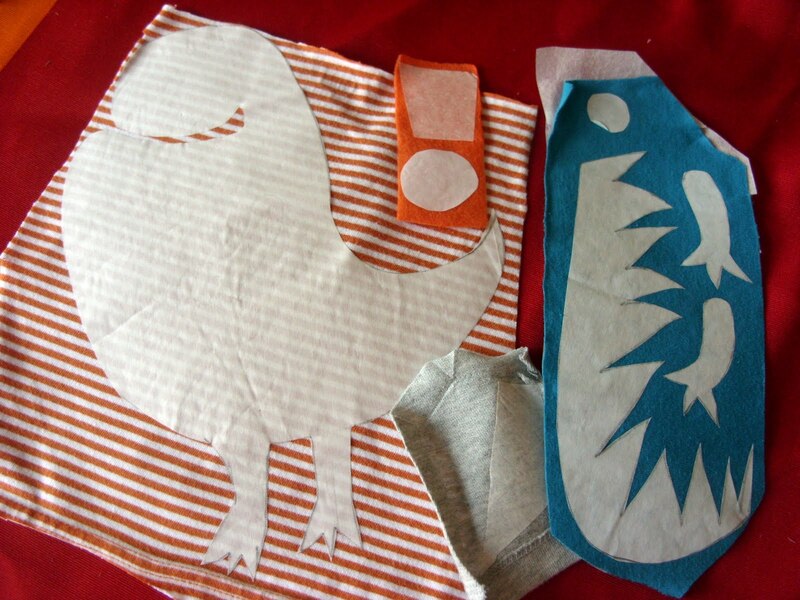 Then, cut out the pattern on the freezer paper. 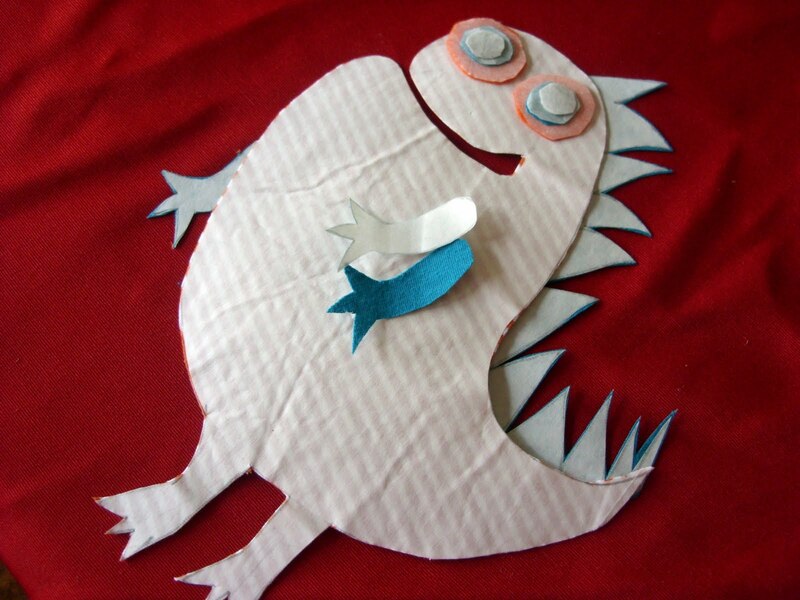 Here is the dragon pieced together. Now this step you can skip if you want but I did it because my son does not like interfacing on the inside of his shirts. 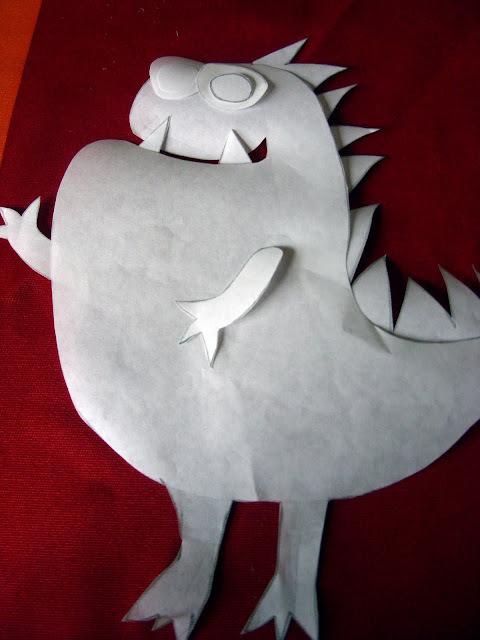 In order to add some sort of stability and make it easier to sew, I ironed on the dragon to a thin piece of white felt. 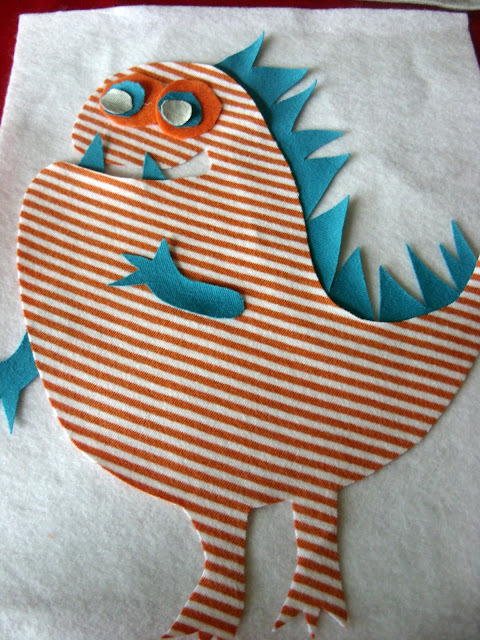 Here is the dragon with the fusible web ready to be ironed onto the felt. and sewed ALL the edges. I think this was the hardest part for me. There was a lot of stopping and pivoting the needle to get the spikes, hands and feet done. My son was happy with his new shirt and his bribe...you know, just to stand still for a good picture. Minus the sharp teeth, I think he was trying to imitate the dragon's smile...love it! How neat!!! I know my boys would love that shirt!! Sorry his bday lands on back to school day :( That's a bummer...but I have a feeling that you're the kind of mom that will make SURE his day is awesome :) Good job on the shirt! GREAT details!!!! 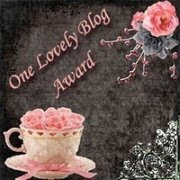 *FUN blog by the way! I'm a new follower! That is such a cute dragon t-shirt! I'm sure his birthday will be brilliant! Such a special and memorable day too - starting school! I'm so making this for my little man...now to just find super cool fabrics like you used! from the first time I leafed through mini boden, I wanted to make some for my little guy... years later and still haven't done it. I totally like yours better than the inspiration shirt. such a great color combination! LOVE that shirt! 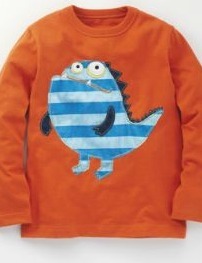 I adore Boden, but the clothes are pricey so this is a perfect solution! 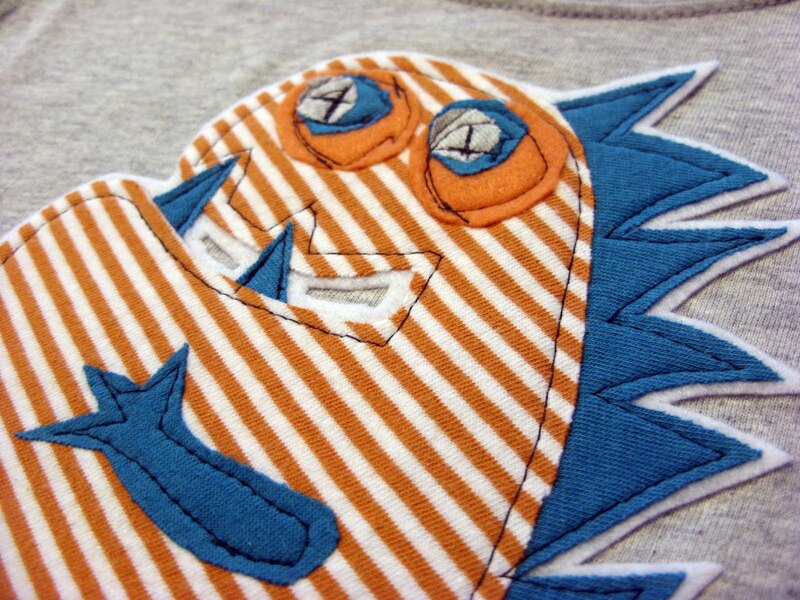 And I like that the stitching isn't perfect, especially on the eyes. It adds to the texture and look of the dragon. Great job! What a great idea!! Makes me wish I was more crafty!! Great work! Love it so much! Stop by and link up to Make It Wear It! Cute cute cute! Great job! 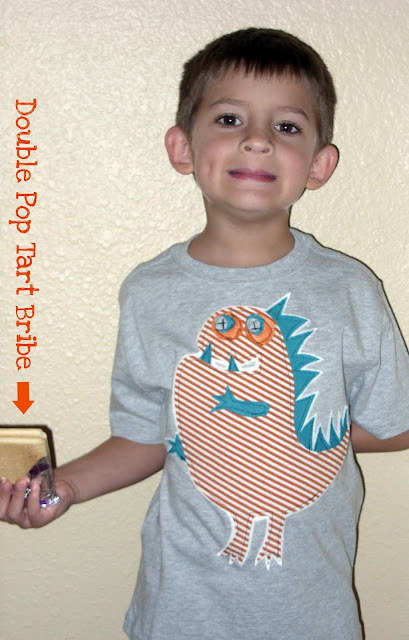 The double pop tart bribe had me giggling. Good job on the shirt. Hopefully he's a bit happier now! 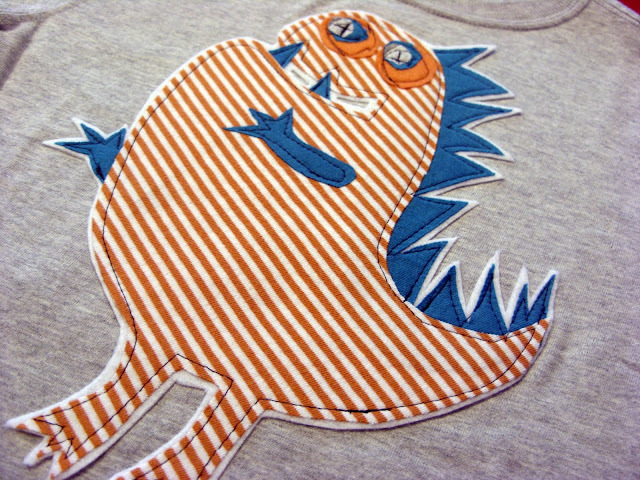 I love Boden tees. What a great recreation. 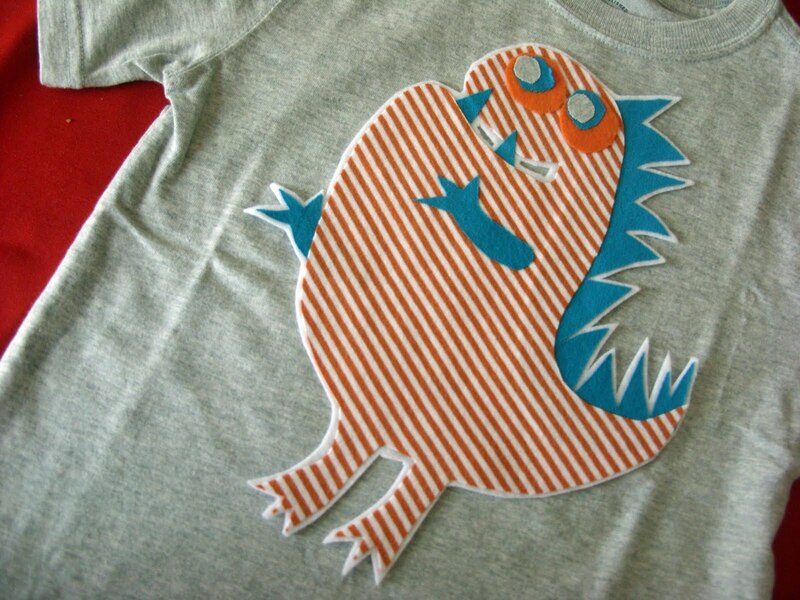 That is such a cute shirt! That took some effort, whew! 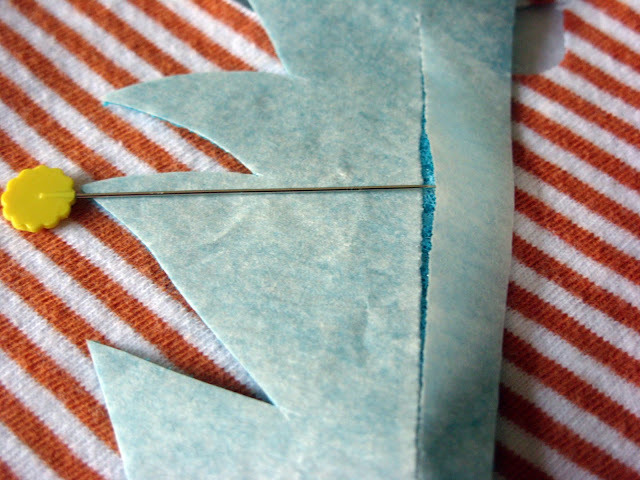 I never thought of using freezer paper as a pattern before, thanks for the tip. Love the dragon, love the smile! Really cute and easy idea! Love it! WOW---you are gifted---this one is better than the Boden one:) Be blessed!!! Great job mama!!! I featured you today! The t-shirt looks funky and cool. Your son is adorable.. love that last pic of his!! Beauteous!! I'm impressed with your creativity and sewing skills!! I love making things for girls, and I am very happy that I have a daughter because I think that there are not enough nice things for boys out there. Well, your gorgeous t-shirt has completely converted me and I might have to make it for my daughter – how about a pink monster? Surely there are pink monsters :-) Thanks for the inspiration! Such a cute shirt! You did a great job! we have developed some nice procedures and we are looking to trade methods with others, why not shoot me an email if interested. I read. 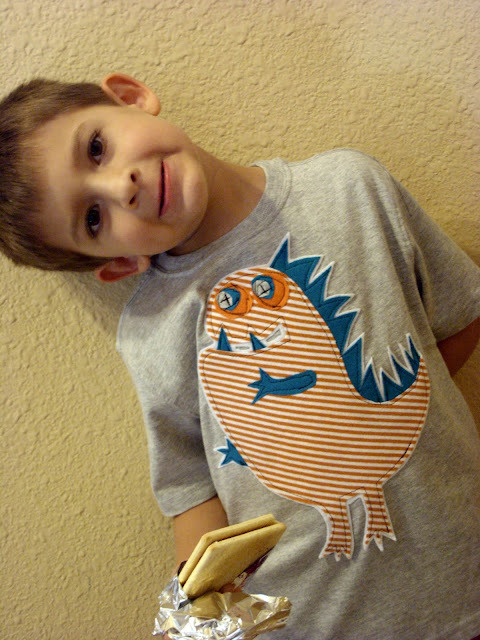 And on this post "Dragon Applique T-shirt ~ A Boden Knock Off". all your community sites like your linkedin profile, Facebook page or twitter feed? came to check it out. I'm definitely enjoying the information. I'm bookmarking and will be tweeting this to my followers! the favor”.I'm trying to find things to enhance my web site!I suppose its ok to use a few of your ideas! !